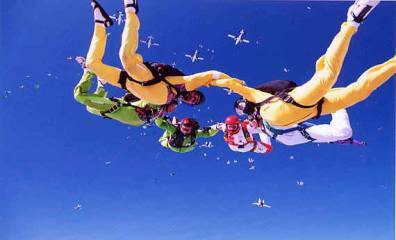 Skydiving, activity and sport in which people jump out of an aircraft-alone or in groups-and land by using a parachute. Because of the sensation of leaping into the air and free falling some distance before opening their parachutes, skydivers usually experience a rush of adrenaline and then a peaceful sense of well-being. This feeling of calm lasts long after they land on the ground. The modern was invented in the late 18th century. In the early 20th century the military began to make extensive use of parachutes, and over time military-designed equipment and techniques gave way to those designed by sport parachutists. Skydiving eventually became popular as a recreational and competitive activity. Every year hundreds of thousands of people skydive worldwide. In the United States, the United States Parachute Association (USPA) governs the sport. More than 30,000 USPA members skydive in local clubs and competitions around the country. To maximize safety, skydivers carry two parachutes. The main parachute is packed in a deployment bag carried on the skydiver's back. A separate parachute system called a reserve is also worn on the back in case the main parachute malfunctions. Before they jump, skydivers make several preparations. The most important is to pack their equipment carefully. They also coordinate their jump plan with the aircraft pilot, discussing weather and wind information and determining the best area for the jumpers to exit the aircraft. Before they board the aircraft, jumpers practice their in-air manoeuvres (Dirt-Dive) on the ground. Then they determine the jump order and a landing approach pattern to ensure that mid-air collisions do not occur. Everyone climbs aboard in the reverse order of exit and straps themselves to the floor or to specially designed jump seats. After takeoff the aircraft climbs to between 3200 and 4200 m (10,500 and 13,800 ft). The pilot and spotter check the progress of the aircraft and the jumpers during the final approach over the jump site, called a jump run. Once over the correct spot, the jumpers line up at the door. Handholds and steps make it easier for some jumpers to climb out in advance. These preparations enable the jumpers in each group to leave the aircraft as close together as possible and to complete all their planned manoeuvres during the one-minute free fall. When each jumper's turn comes, he or she takes a step away from the aircraft and begins free-falling. Within 10 to 12 seconds, the jumper reaches terminal velocity, when the air resistance equals the pull of gravity. Average-sized skydivers fall approximately 320 to 450 m (1050 to 1480 ft) every five seconds, reaching 190 to 240 km/h (120 to 150 mph). Skydivers also move horizontally at speeds up to 80 km/h (50 mph). During the free fall, skydivers manoeuvre by changing their body position. They increase or decrease their speed by becoming more or less aerodynamic (streamlining their bodies or stretching out their arms and legs to catch the air). 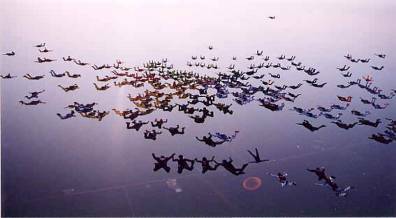 At approximately 1200 m (3900 ft), any group activities cease as the jumpers turn away from each other and form their bodies into a straight, stiff, headfirst posture called a tracking position. They move away from one another, and when they have gained enough separation, they wave their arms, a signal to deploy their parachutes. Jumpers begin deployment by extracting a small pilot chute folded in a pouch on the parachute system. The pilot chute fills with air, pulls the parachute container open, and then drags the tightly packed main parachute from the jumper's backpack. As the main parachute opens, it fills with air and takes on a wing shape, becoming a canopy that slows the skydiver's fall. Full deployment from pilot chute to open, manoeuvrable canopy takes only two to five seconds. The parachute canopy travels forward through the air at about 80 to 100 km/h. The skydiver steers it with two primary controls, called toggles, which are gripped above the head with the hands. Each toggle attaches at several points along one side of the wing's trailing edge. Pulling one toggle slows the parachute on that side and causes the skydiver to turn in that direction. Pulling both toggles causes the parachute to flare, or slow the descent and forward speed of the jumper at the same time. A typical parachute ride lasts for two to three minutes. Jumpers in a well-disciplined group avoid collisions by spacing themselves out and landing in an orderly sequence. When at the landing site, each jumper faces the wind to reduce forward speed. Just before a jumper lands, he or she flares the parachute, which softens the landing. Experienced skydivers often land on their feet, running forward. On difficult landings, jumpers can roll forward to avoid injury to their arms and legs. Jumpers need to perform two tasks on any skydive to make it a safe jump: open the parachute in time and land in a safe area. Students should always learn from a certified instructor. Beginners may choose from three types of first-time jump courses: tandem, static-line, or harness-hold. In the United States, harness-hold jumps are called accelerated free fall (AFF) jumps. Tandem jumping allows two people on one parachute system. After minimal ground training, the instructor and student jump together from between 2500 and 4200 m (8200 and 14,000 ft). Free fall lasts 20 to 60 seconds. By jumping in tandem, students learn from their instructors while actually steering the parachute during the jump. 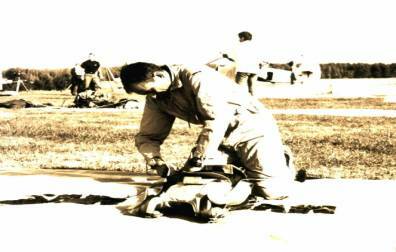 Before they jump solo for the first time in static-line jumps or AFF jumps, student jumpers must attend more intense ground training to learn how to exit the aircraft properly, operate the parachute, stabilize the fall, monitor altitude, and steer and land the parachute. In addition, all solo jumpers must know how to handle the problems that may occur at any point during the jump. Static-line jumping was adapted to recreational skydiving from military methods and requires several hours of ground school. At the beginning of a jump, the parachute and aircraft are attached to each other via a strong nylon rope called a static line. When the jumper is far enough from the aircraft, the line becomes tight, automatically deploys the parachute, and releases from the jumper. During a static-line jump, skydivers leave the plane at an altitude of 900 m (3000 ft). Those students wanting to experience the thrill of free fall attempt an AFF jump. After a day of training, the student exits the airplane from 3000 to 4200 m (10,000 to 14,000 ft) with two instructors alongside for assistance. They coach the student with preplanned hand signals. The student and instructors free-fall for 40 to 60 seconds before deploying their parachutes. The instructors descend slightly below the student and land first. Jumpers can wear almost any type of clothing while skydiving. Most enthusiasts prefer special jumpsuits that improve aerodynamic performance and have handles, or grippers, that fellow jumpers can grasp when performing group manoeuvres. A modern parachute consists of four basic components: main canopy, reserve canopy, Cypres and the harness-container system. Main Canopy with different size and colours. Size depends on Skydiver weight. Modern Canopy are from 89 sq.ft to 260 sq.ft. Price between 1800 to 2200 US Dollar. Reserve Canopy are also same as main canopy. With different size and colours. The Price between 1100 to 1500 US Dollar. CYPRES - Developed for the experienced skydiver Automatic activation devices (AAD) have for many years been part of sport parachuting. Almost exclusively however, they have been seen as a student requirement, and have been shunned by the experienced skydiver. The reasons for this are many and varied but predominately stem from the fear that they are not totally reliable and might fire inadvertently in free fall. The dangers of premature canopy deployment during Relative Work are obvious to all and indeed; many skydivers will not participate in RW with someone wearing a conventional mechanical AAD. The fact remains however, that far too many skydivers die each year when they shouldn't. Free fall collisions, faulty or unfamiliar equipment, disorientation, improper or incomplete emergency drills - the reasons are many. The cause of death is always the same, ground impact! And in the vast majority of cases the skydiver impacts with an unopened reserve or one that has been activated far too late. The concept of Cypres, which is the acronym of "Cybernetic Parachute Release System," started in 1986. The design philosophy was to produce an AAD, which was totally reliable, would not and could not fire until the pre-programmed parameters were met, and could therefore be used in all the advanced skydiving disciplines with total confidence. The only possible way to achieve this was to make use of advanced electronics, which is what Cypres does. Four years of development, a large investment sum and the granting of worldwide patents made the realization of Cypres possible. The Cypres processing unit, or brain, has the calculating power of a personal computer and is programmed to take account of all eventualities. It can tell if you are falling in a stable position, if you are upside down, or even if you are doing a backloop - and it constantly makes adjustments to correct for the consequent pressure changes around the body. If you pass 750ft above ground level at a speed of 78 mph (115ft per second) or more, Cypres recognizes the fact and an electronic impulse activates the release unit. This cuts the reserve closing loop cleanly to allow for instant reserve deployment, irrespective of ripcord pins, handles or cutaway systems. And let's face it; if you are still in free fall at 750ft, conscious or unconscious, you need a reserve - NOW. It doesn't matter how experienced you are, hit the ground in free fall and you're dead! Cypres is the only totally accurate, reliable and foolproof AAD for the experienced skydiver. Life insurance against the unexpected. The parachute canopy is a rectangular, inflatable wing, open in the front to scoop, or ram, air. It is sewn closed in the back, which forces the parachute to remain filled. The ram-air canopy is constructed of a series of airfoil-shaped sections. Sewn together side by side, they form a wing resembling an air mattress. The reserve canopy is deployed only if the main canopy does not function properly. The two canopies are stored in a container that attaches to the jumper's backpack. The backpack attaches to a harness made of strong, durable, nylon straps. Skydivers wear the harness buckled around the thighs, chest, and shoulders. It attaches to the base of the parachute risers, four straps between the jumper's shoulders and the suspension line of the canopy. These lines ensure that the skydiver and canopy remain connected during the descent. Many jumpers wear an altimeter and an audible altitude alert to help them track their descent. When a skydiver reaches the canopy deployment altitude, the alarm goes off and reminds the skydiver to open the parachute. Jumpers wear goggles to protect their eyes during their rapid descent, as well as lightweight head protection and footwear suitable to their landing site. Many jumpers wear light gloves during cold jumping conditions. Skydiving's international governing body, the Federation Aeronautique Internationale (FAI), officially sanctions six competition skydiving disciplines. Pakistan is also an active member of FAI. Free-fall style and accuracy landing are the classic categories. The most popular competitions are formation skydiving and canopy formation events. The newest events are freestyle, skysurfing, Skyball, Tube Jumping, Head-down, Speed Freefall, and many other specical styles. Free-fall style and accuracy events are called classics because they are the oldest forms of competition. Free-falling contestants perform a series of prearranged acrobatic manoeuvres before reaching an established parachute-opening altitude. Judges on the ground watch each jumper through binoculars and award points based on the style of each jump. During accuracy events, participants attempt to land on a clearly marked ground target that is 3 cm (1 in) in diameter. Judges measure the distance between the jumper's landing spot and the center of the target. The jumper with the lowest combined distance after a series of jumps wins the event. Team events are the most popular form of skydiving competition. 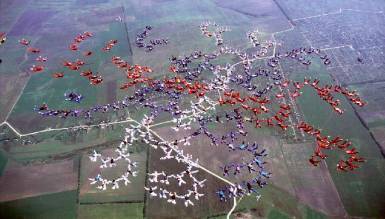 In the formation skydiving event, groups of free-falling skydivers form predetermined geometric patterns by holding on to one another. In teams of 2 to 100 individuals, jumpers race to build the greatest number of patterns in the allotted time. In canopy formation skydiving, jumpers build formations after they have opened their parachutes. During both events, teams receive points for style, difficulty of formation, and the number of formations completed during a single jump. 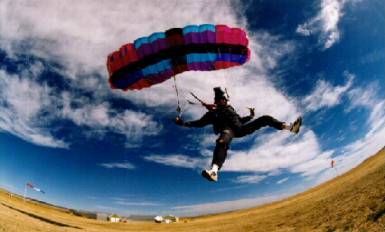 The newest skydiving competitions are individual events called freestyle skydiving and skysurfing. Like free-fall style, freestyle jumpers perform acrobatic manoeuvres while in free fall. Freestyle skydivers, however, do not perform prearranged sequences. Instead, they create their own routines. The specific movements of these routines are often more difficult than those of free-fall style jumpers. Sky surfing involves the use of a sky board (much like a snowboard) to surf through the air. Competitors are judged by the difficulty and style of their manoeuvres, which include loops, 360-degree turns, and twists. Skydiving world championships are held every two years. In years when the world championships are not held, an international competition called the World Cup is held. Traditionally, the United States and France have dominated formation skydiving and canopy formation events. European jumpers dominate the classic events for the men. American skydiver Cheryl Stearns, who has won more world skydiving championships than any other competitor in the history of the sport, has dominated classic events for women. Individuals in China may have used parachutes as early as the 1100s, and inventors such as Leonardo da Vinci of Italy created plans for parachute-like devices, but skydivers consider French inventor Andr�-Jacques Garnerin to be the first parachutist. He first made a jump using a parachute in 1797, leaping from a balloon over Paris. He made many subsequent jumps in other parts of France and in England. The first parachute designs for use in airplanes were not developed until after the Wright Brothers made the first aircraft flight in 1903. As aviation became more common, parachute use also increased. Parachutes were first used for military purposes in World War I (1914-1918). Balloon-borne observers, who often drew enemy fire at their lofty positions, used them for a quick escape. After World War I, aerial showmen called barnstormers ignited the imaginations of future aviators and skydivers. Each year barnstormers travelled across the United States demonstrating airborne performances and parachute jumps. With this increase of parachuting awareness, competitions also began. In 1930 the first accuracy landing competition was held, in the Union of Soviet Socialist Republics (USSR). During World War II (1939-1945) military forces deployed parachute-equipped soldiers called paratroopers. The most famous use of paratroopers occurred on D-day, the invasion of Normandy (Normandie), France, on June 6, 1944. Allied paratroops landed behind enemy lines before sunrise and silently secured areas to make it easier for other soldiers to come ashore from boats. After World War II there was a surplus of nylon parachute equipment. This, coupled with the U.S. Army's formation of military sport parachuting clubs, led to modern recreational skydiving in the United States. Similar conditions prevailed in other countries, and in 1951 Yugoslavia hosted the first parachuting world championships. Specially developed sport parachute systems began replacing military surplus systems in the mid-1960s as parachutists began calling the sport skydiving and calling themselves skydivers. 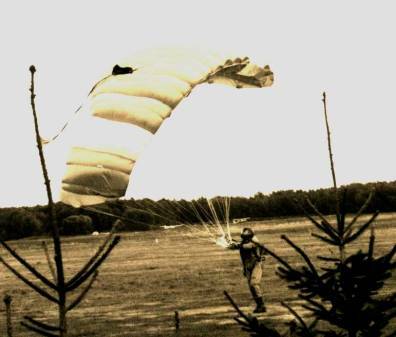 Sport modifications to military parachutes improved their opening characteristics and made them more manoeuvrable. In 1964 Domina Jalbert, a French Canadian kite builder, conceived the ram-air design that rapidly became the standard parachute for skydiving. 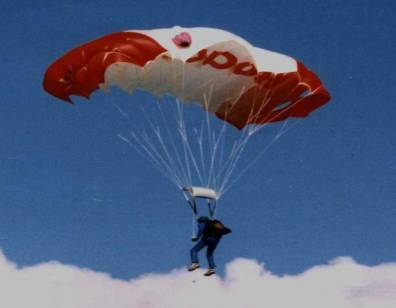 During the 1970s and 1980s sport skydivers tested improved designs and materials. Special non-sport uses of sport-generated designs were also invented, including military HAHO (high altitude, high opening) designs, which enable soldiers to fly silently over great distances; smoke jumping designs for accurately delivering fire-fighters into remote forest fires from low altitudes; and a variety of applications for two-person and four-person tandem jumping equipment. After the late 1980s skydiving continued to grow in popularity around the world. Reliable, lightweight, and easy-to-operate equipment made the sport accessible to a larger population, and jumps by celebrities. First Jump with static line. It is also a way of fun.